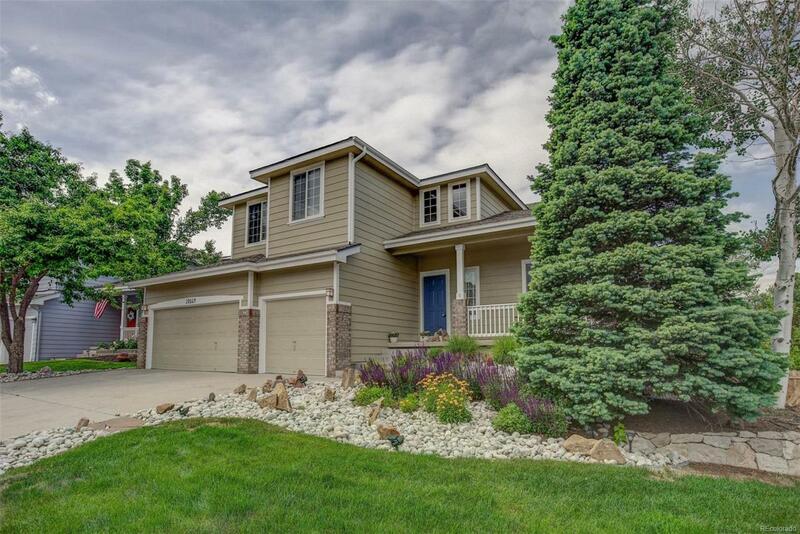 Gorgeous unique home on a corner lot w mature trees, an ideal location. Walk in to great room and formal dining room. The kitchen is remodeled and has stainless steel appliances and granite countertops. There is a powder bath on the main floor and rough-in in basement. The basement walks out onto patio. Patio and deck have mountain views. The gas grill is included and hooks up to home. The second floor of the home has three bedrooms with a loft that can be converted to a fourth. The piece de resistance of this home is the master bedroom. Escape into your custom master retreat with a walk-in closet. It includes a master bathroom with a huge shower and soaking tub. It also includes an additional vanity room next to the master bathroom. Heated Floors in the master bed and bath. Other great features of this house include a laundry room with the washer and dryer included, new exterior paint, water softener, and a three-car garage room for a workshop. Move in quickly!